When you can't step out on the diamond and knock a few over the fence, baseball board games help you enjoy the sport of baseball indoors. These games are designed to appeal to all ages and allow even the youngest family members to get in on the fun. Statis-Pro is an old game that was created in the 70's but still remains a lot of fun. Produced by Avalon Hill it is now out of print but can still be found at auction sites like eBay, or through flea markets and local rummage sales. You assume the role of a manager of a baseball team with many options available to you. You get pitcher and batter cards and can play an entire season of baseball with individual games taking under 30 minutes. The game offers limited defensive options which allows single player games to be as fun as play with a second player. An online version of the classic board game is also available. Try Baseball Tycoon to get the full baseball experience, from field play to management. You are the owner that has to mix business with baseball and keep making money and making your team win. You have to sign baseball players, suspend players, deal with injuries and strikes and more. You spend money on players, ranging from the mediocre "scrubs" to the expensive "ultrastar," as well as a manager. Then, on a Monopoly style gameboard, move around the board overcoming obstacles and problems. Your ultimate goal is to make a championship team and get to the Winner's Circle. If you want to stay way from the card-like games, then pick up Big Bucks Baseball. The board is an actual baseball field so you get to simulate a real game with dice and a pitch/hit roulette wheel. Based on those two factors, you either earn money to buy players and other concessions, or you lose money. 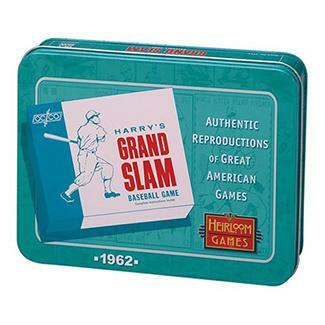 Harry's Grand Slam by Out of the Box allows players to manage a baseball team by collecting and playing cards to represent actual plays in baseball. For example, when at bat, a player will choose from the cards in his hand to determine the type of play made, such as single, strikeout or home run. The game is designed to be played with two players and a complete game takes less than 20 minutes. Reminiscent of penny arcade baseball games, Front Porch Classics Baseball is suitable for nearly any aged player. You use a metal ball (much like those found in pinball machines) and a wood striking device. You swat the ball around the field to make hits and earn runs. You can buy the game from their website and have it emblazoned with the logos of the Major League Baseball team of your choice. 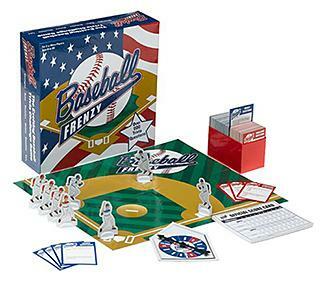 Ultimate baseball fans will appreciate Baseball Frenzy, a board game focused on baseball trivia. Played like a real baseball game, players answer multiple-choice and true/false questions to make plays and move their players around the diamond. For a unique perspective, check out the Deluxe Stadium Baseball Game. The game features a baseball diamond with a spring-loaded batter and a pitcher to allow players to really hit the ball and practice different types of pitches. 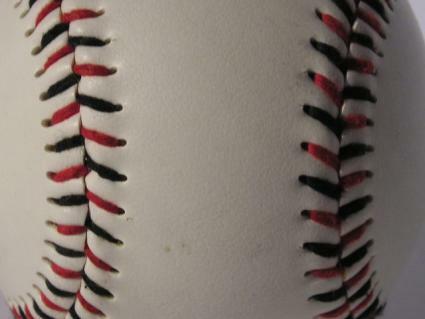 The ball falls into pockets that are labeled with different plays, such a single, double, triple and whether a pitch resulted in a ball or a strike. A former game of the year, Headz Baseball Family Fun Strategy Game is a fast-paced game designed for family members of all ages. The game combines play cards with character cards and game-sized bats and balls. Each character has the ability to play certain roles in the game. Along with traditional baseball plays, players may steal pieces of uniforms from character puzzles to take another player out of the game. Bible Baseball offers a different approach to traditional game play. The game combines Bible trivia and the game of baseball to motivate kids to learn about the Bible. As players answer questions about the Bible correctly, they get the chance to move around the bases by hitting singles, doubles and triples. Baseball board games are not limited to those who enjoy baseball. Non-baseball fans will enjoy learning about the game in order to beat the more knowledgeable fans. The games also give families a chance to interact with one another and focus on the strategy and fun involved with the game.